Midcap IT stocks are likely to outperform in 2016. These stocks will be benefited from ongoing digital India and various other projects. Valuation of midcap IT stocks is very good compared to large cap IT stocks. 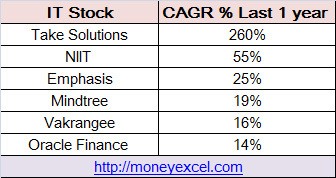 Recently it is also observed that performance of midcap IT stock is better compared to large cap stocks. TCS, Infosys, Wipro had given negative returns of around 12% in 2015, however, Take solutions, Mindtree, Emphasis, Vakrangee, NIIT and other midcap stocks had given returns in the range of 4% to 250%. Not only that, IT stock is expected to give very good returns in 2016. So, it will be beneficial to invest in midcap IT stocks for 2016. Polaris Consulting & Service is dealing in financial technology products. This company provides solution related to core banking. As per recent news, Nasdaq-listed Virtusa Corp. is in discussion with Polaris to buy a major stock stake. One can purchase this stock with target price of 260 Rs. NIIT is next midcap IT stock pick. NIIT is dealing in providing computer software training. The stock price of NIIT is growing continuously since past one year. NIIT has given around 55% return in last one year. NIIT is likely to perform well in future also. Target price of NIIT is 130 Rs. Firstsource solutions is a small medium software company. It is expected that this company will be growing at the rate of 6% in 2015. Order book value of this stock is good and it is expected that Firstsource Solutions will be getting the order from new clients in the current year. Target price of this stock is 60 Rs. Hexaware is next recommended midcap IT stock. Hexaware is Mumbai based IT outsource service provider company. Hexaware has performed well in financial services, health care & insurance sectors. NASSCOM has ranked Hexaware in the list of top 20. You should buy Hexaware stock at every fall. Mindtree deals in e-commerce, cloud computing, BI and data analytics. Mindtree has multiple clients across the globe. A major customer of Mindtree is from USA and Europe. A depreciating cost of rupee will give a major boost to this company. Mindtree is a fastest growing company in IT sector. One can invest in Mindtree with the target of 1800 Rs. Why one should invest in midcap IT stocks? Revenue growth of midcap IT stocks is improving continuously. Valuation of these stocks is attractive. Some of these stocks are available at reasonable rates. Depreciation in rupee will give a good advantage to these companies. 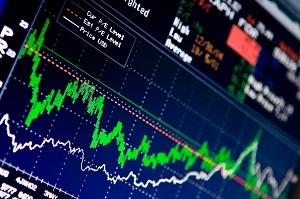 US economy is recovering gradually and it is a good indication of IT stocks. It is recommended to invest in mid-cap stocks compare to large cap stocks because of good earning potential. I would like to put my bet on Mindtree and Polaris, I think NIIT have already zoomed enough in the last 1 year with the news on IT companies consortium.